Click on The Positive Influence Of The FairTax On The American Economy to learn the impact that enactment of the FairTax bill (HR 25) will have on our lives. This post is included on RTE under The FairTax found on the left hand side of the blog. 12. makes clear that after enactment of the FairTax the ordinary citizen will never come into contact with a federal agency for the purposes of collecting taxes again. 1. 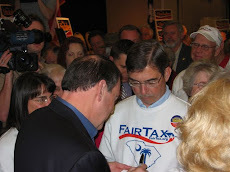 The enemies of America have managed to bottle up HR 25 in the House Ways & Means Committee because the Joint Committee of Taxation has no methodology to properly evaluate the FairTax meaning that it will not come out of the Ways & Means Committee onto the floor of the House as it stands – even if we had the votes to pass it which we don't. The House statists have checkmated the FairTax into the corner of W&M where they plan to keep it. Source – Alex Poirot of Congressman Woodall's office. 2. The only chance the FairTax has of becoming law is with an unwavering proactive endorsement by a presidential candidate who wins the election. 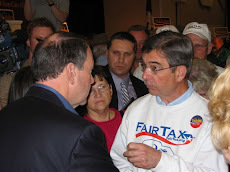 With Governor Huckabee dropping out of the presidential race the only candidate remaining who is a FairTax cosponsor is Senator Ted Cruz – & he has his own tax nightmare plan that includes an income tax & a form of a value-added tax – a combination of taxes used by every stagnate economy throughout the world. 3. With the retirement of Neal Boortz the FairTax has had no national spokesman for three years. Herman Cain, a former FairTax supporter, has his own national radio program, but neither Herman or any listener calling in has mentioned the FairTax in months – @ least not when I listen which I do every day. 4. Many who do speak or write about the FairTax make serious technical errors, mostly through overselling the benefits of the FairTax. Accordingly, critics have a field day calling into radio programs or attacking letters to the editors thereby making it harder for people attracted to the idea to learn it properly. 5. After all of the years the FairTax has been around there still are far too many misunderstandings by people who have supported the FairTax for years. Two persistent examples are A) what will happen to retail prices after enactment of the FairTax & B) what the taxation of government entails. With or without a presidential candidate or national spokesman the FairTax will never move forward until the principles are clearly & correctly understood. All I can promise, especially to the 66% of Americans who feel the country is in decline, is that if you want to learn the principles of the FairTax, that brings back the prosperity & liberties the country was founded upon, I will not be the reason that you don't. Thanks Doug - A timely reminder. Doug - you correctly point out the major benefits which are proven and very compelling. Let me add one more: the Fair Tax will encourage the low income to develop new work skills, work harder, earn more money as they will be able to keep much more of their paycheck. This will act to increase GDP. Our economics savvy politicians (not many but we have a few), must point this out to the low income to get their support. This will increase probability of passage. I thought the latest RTE post was very interesting. You're right about Congress doing everything it can to bury the Bill. For whatever reason, it seems they are determined to keep the IRS. So sad that many who had supported HR 25 have abandoned it. Mike Huckabee is the only one who still talks about it. Too bad he dropped out of the race.